The round goby—a small, extremely prolific, invasive fish from Europe—poses a threat to endangered freshwater mussels in northwestern Pennsylvania's French Creek, one of the last strongholds for two species of mussels, according to researchers. 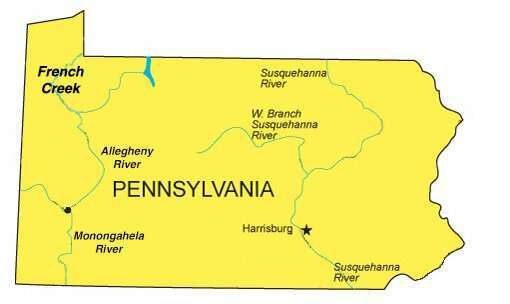 French Creek flows from southwest New York state about 117 miles to the Allegheny River at Franklin, Pennsylvania. It is the most species-rich stream in Pennsylvania and is nationally recognized for its biodiversity, with more than 80 species of fish and 29 species of freshwater mussels. Four of the mussels in French Creek are listed under the Endangered Species Act: northern riffleshell, snuffbox, clubshell and rayed bean. 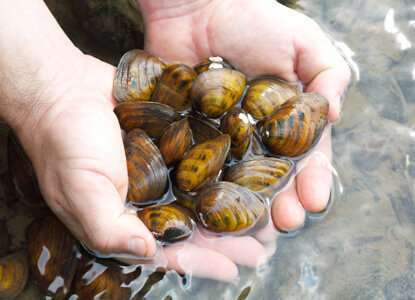 Northern riffleshell and clubshell mussels are considered critically imperiled and have lost 95 percent of their historic global range—but they appear to have stable populations in French Creek. Predation by the round goby, however, is likely to destroy that stability, warns Jay Stauffer, distinguished professor of ichthyology, Penn State. His research group in the College of Agricultural Sciences confirmed that growing numbers of the bottom-dwelling fish, which do not grow longer than 10 inches or so, are eating native mussels in French Creek. Originating from the Black and Caspian seas, round gobies were introduced into the Great Lakes by the release of ballast water from large trans-Atlantic cargo ships around 1990. Able to live in saltwater or freshwater, they were first found in Lake Erie in 1995, where they are now the most common of all fishes in the lake. From there, they were likely transported in bait buckets carried by fishermen to LeBoeuf Creek, a tributary of French Creek, where they were discovered in 2013. "It is not an overstatement to say that French Creek is a one-of-a-kind waterway, and that gobies being introduced to that watershed could end in an ecological disaster," Stauffer said. "Now that they are in French Creek, we are never going to get rid of them. So, we are now trying to gauge how much danger they pose to native species and how much damage they will do. We think that this is going to be a huge problem." To document the diet of round gobies in the French Creek watershed to determine whether consumption of native, freshwater mussels is occurring, researchers collected round gobies in the summer months of 2016 using a kick seine in four locations. They then dissected the fish and closely examined their stomach contents. Gobies were separated into categories based on length so researchers could determine if their diet changed with increased size and age. Their findings, which were published today (April 1) in American Midland Naturalist, showed that native mussels were consumed by gobies of all lengths in French Creek. This is the first research focusing on the ecological impact of gobies on unionid mussels in a stream environment in the United States. Many previous studies have looked at gobies' impact on the biomass and food chain in the Great Lakes. The gobies' introduction into French Creek and the specter of them consuming endangered mussels is a worst-case scenario, noted lead researcher Casey Bradshaw-Wilson, now assistant professor of environmental science at Allegheny College, who was a doctoral student in Stauffer's group when the research was started. "While human alteration to stream systems in North America has pushed these mussel species toward decline, many species of mussels in French Creek are thriving," she said. "The introduction of round gobies into the French Creek watershed poses a serious threat to native mussels, both directly through their consumption of juveniles and indirectly through goby-caused decline of the fishes mussels use as hosts to be transported during an early stage of their life." The results of the research—as ominous as they are for French Creek and its endangered mussels—portend the gobies will wreak havoc with shellfish related to another watershed that also starts in New York and flows through Pennsylvania, Stauffer believes. And although that river, the Susquehanna, is almost 200 miles and three hours' drive away, he predicts that gobies will get there in fishermen's bait buckets. The Susquehanna River empties into the Chesapeake Bay, which has been called a world-class, oyster-making machine. With tons of fresh river waters pouring into it daily, a constricted mouth and shallow waters, that estuary is one of the largest bodies of ideal oyster habitat on earth. If round gobies get there, Stauffer warns, they could ruin a multi-million-dollar oyster industry. "The threat to the oyster beds in the lower Susquehanna River, and really all of the Chesapeake, is real—I think it will happen in my lifetime," he said. "Someone is going to use them as bait in the Susquehanna, that is going to happen. From there, it is just a question of time until they get into the bay."